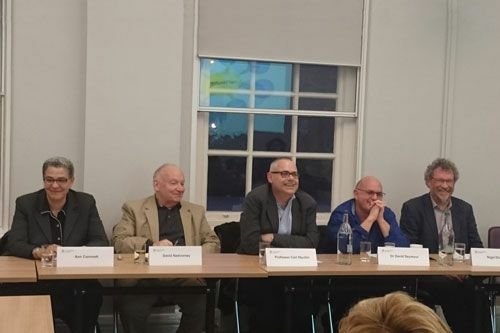 The City Law School’s Spring Lecture Series ended on a lively note when legal academics from City and the City University of New York School of Law debated the prospects for legal education in the UK and the US. The panel debate, The Future of Legal Education: Transatlantic Perspectives, on 23rd March, was opened by LLB Programme Director (Academic Programmes), Dr David Seymour, who outlined the broader context of the future of undergraduate legal education and changes to the Qualifying Law Degree (QLD). Dr Seymour reflected on the demise of the welfare state and the funding of undergraduates over several decades in the UK. He noted that there once was a welcome diversity within the student body. He reflected further on the idea of self-selection and higher education and the impact of the proliferation of new forms of legal professional. Professor of Legal Education, Nigel Duncan, outlined what he considered to be a variety of contexts and issues in the future of legal education. He drew attention to shifts in the role of the state and government policy on tuition fees. The introduction of changes to interest rates and the terms of loans were significant developments, he stated. Professor Duncan also spoke about the role of regulations and commercial pressures in the face of the reduction to legal aid services, outsourcing, the Research Excellence Framework (REF) and the Teaching Excellence Framework (TEF) and changes in technology. 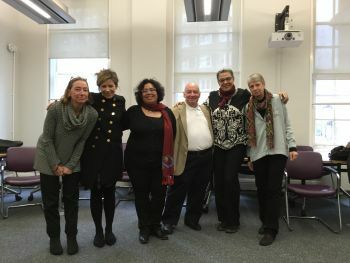 The City University of New York’s (CUNY) Professor David Nadvorney, addressed the role of diversity and pathways of access to legal education in America. He referred to a cycle of ‘boom and bust’ and the 'contraction of the curve of expansion in higher education'. "Access and diversity must be central to legal education, as well as to the legal profession and the bench. But to be truly realized, access (or 'widening participation' in the UK) must be accompanied by thoughtful, comprehensive, and genuine support and resources." He examined support structures in the context of access and expanded on the various measures taken at CUNY Law School, specifically around mid-term student exams. He also explained some of the bottlenecks within the American legal education system in generating access to it and informed us of the extensive measures adopted at CUNY to address these issues. Professor Ann Cammett developed the question of the future of readiness for the Bar and the legal profession together with the place of crises in legal education. She outlined the mission of CUNY Law School and the part it is playing in developing excellence in reporting reform metrics: CUNY Law School was ranked third in the US for clinical legal education and she put the spotlight on the resources required to deliver the highest-ranked resources and support for this to be accomplished. She then turned to the current American socio-economic and political climate, including mass incarceration, the size of student loans in public versus private law schools and the role of public service lawyering. The discussant, Senior Lecturer, Linda Jotham raised the issue of radical versus small-scale or micro changes needed to respond to the pressures outlined by all of the speakers. The Research Excellence Framework or REF, is the successor to the Research Assessment Exercise, a method of assessing the research of British higher education institutions. It took place in 2014 to assess research carried out during the period 2008–2013 inclusive. The results were published on 18 December 2014.